We headed out of Tokyo about a week after we arrived in Japan. We could have stayed in Tokyo forever since we were really enjoying staying with our friends Tod and Kristen. However, we'd purchased a rail pass before we arrived - so we figured we should get our money worth out of the rail pass. There was a red tori gate standing in water that Seth had always wanted to see and there was a Doraemon train that Tara wanted to ride. We headed towards the Doraemon train first. The Doraemon train left from Aomori station - seven hours North of Tokyo. 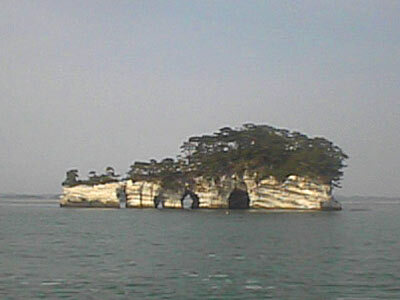 Therefore, we planned to break up the long journey by spending the day in Matsushima. We got a late start out of Tokyo. After packing up, doing last-minute errands, checking our e-mail a final time, visiting the tourist office and getting footrubs at our favorite massage place, we boarded the 7pm Shinkansen train bound for Sendai. 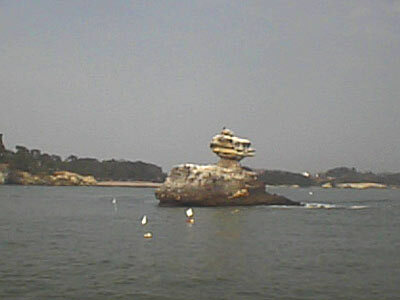 Matsushima was then a 30 minute local ride beyond Sendai. Unfortunately, the headache that Tara had woke up with worsened on the train. We therefore spent the night in Sendai instead of traveling all the way to Matsushima. Our ryokan in Sendai was wonderful. We were greeted by three smiling, bowing people who were shouting out "irashaimase irashaimase" (welcome, welcome!). They were very happy to see us! The husband showed us to our room and we were happy to see that it was a traditional Japanese-style ryokan with tatami mats. The tatami room with real wood and a low table with cushions was gorgeous. We even had a TV and take-away toothbrushes and toothpaste! After a couple of minutes, there was a hesitant knock on our door. The wife had come to explain the nightly bathing procedures to us. Tara went along with her as she walked down the hallway. At the end of the hall were two doors. Tara was shown one and then a 100% Japanese script sign while the couple said "family time". After a few questions and answers in Japanese, Tara deduced that she and Seth could hang the sign on the outside of the door and take a bath together. FUN! Tara loved the bath but Seth called it the kettle. 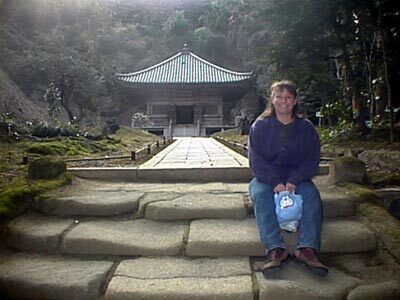 Tara's headache was much better the next morning so we headed off to Matsushima. 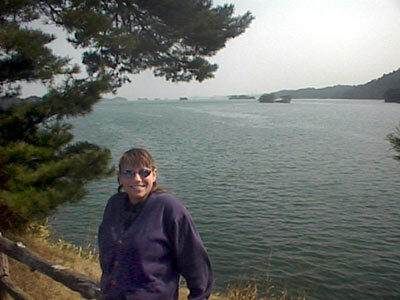 The Fodor's book that we'd borrowed from Tod and Kristen said that Matsushima Bay, with it's many small islands, was one of Japan's three most scenic places. Therefore, we decided to take a tourist boat through the bay. We JUST missed getting onto a very kool-looking Chinese dragon boat, so we had 30 minutes to wait. We decided that the town the tourist boat left from could have been one of Japan's three most un-scenic places! After about ten minutes though, we left the industrial docks area and started seeing islands. The islands were very, very unique. Many were tiny and all were rock-based. 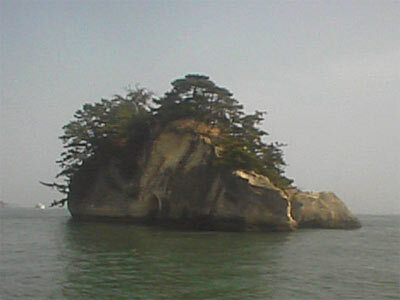 The larger islands were forested on top of the rock. We could not fathom for some of the islands how the trees were able to take root. We could see how the interesting shaped had been formed since the rock was banded horizontally. We think the water level was once higher and small waves eroded the softer rock. Now that the water level was lower, the eroded areas were visible. Numerous islands also had caves running through all the way through them. Others displayed the start of caves where the water would need a few hundred more years to cut all the way through the islands. The other interesting thing about our cruise were the numerous fish catching sticks visible in every direction you looked. At times, it seemed like there were thousands of sticks sticking out of the water. 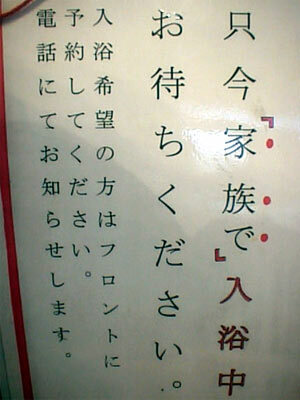 If we had been fluent in Japanese, we would have fully understood the cruise explanations. But, as it was, we were left wondering exactly what all these traps were catching. Matsushima town was very quaint and we enjoyed wandering around the shopping and temple areas. 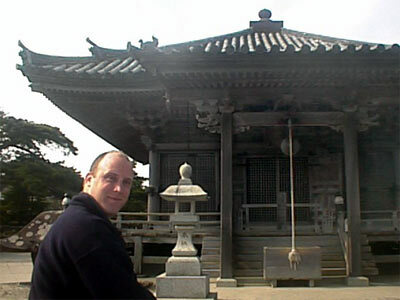 Right after docking, we headed to a small temple on an island. 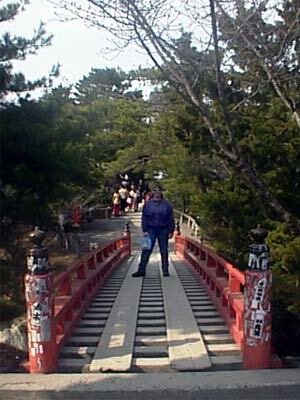 The three red bridges leading to this temple, Godaido Hall, were quaint. The temple itself was also very picturesque. We were unable to go inside though, since this particular temple is open only once every 33 years! The next scheduled opening is in 2006. 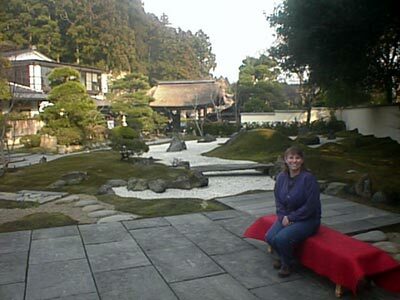 We were very, very happy that Matsushima was nearly deserted. We were one of about seven people on the cruise over and we even had this temple practically all to ourselves. 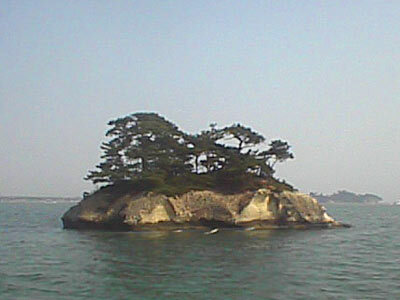 It was neat to see one of the rock-based, tree-topped islands up close. We still couldn't figure out how the trees had taken root in the rock! After a bit of shopping and lunch, we headed down a magnificent tree-lined path towards more temples. There were caves carved into the rock behind the trees and just magnificent scenery as we walked under the trees. We didn't have all that long before everything started closing at 5pm, so we had to decide between visiting a temple and the aquarium. Seth saw a temple with a peaceful looking rock-garden and that decided us. We had this place all to ourselves also except for a few gardeners trimming trees. The rock garden's tranquility just could not be captured on film. It was very, very nice just to stand at the edge and admire the rocks, the moss growing on them and the raked small stones between them. After a long time at the rock garden, we headed along the route towards the main temple. 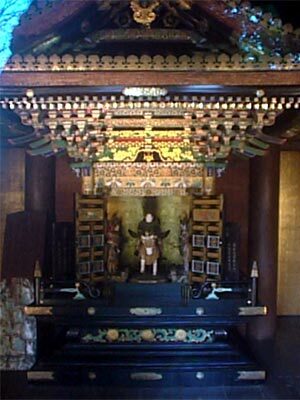 We'd been given a long English description of a shrine containing a man on a white horse surrounded by men who's committed suicide for their lord. Instead of seeing this man, we found stairs leading up to a wooden temple nestled inside of small cliffs. It was very picturesque! We took lots of photos. It was only after we walked up to the wooden temple that we saw what was inside of the building. There was the lord on the white horse. We read the English description we'd been given and were even using our binoculars to look closely at the brightly painted designs. While we were inspecting the temple, a woman and her grandson also came to have a look. They were gone long before we were. We were astonished at how the colors were still original from hundreds of years ago and that the colors themselves had been produced from such materials as copper rust for green and crushed coral for red. 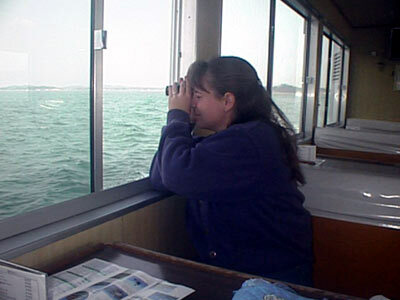 We were also happy to have the binocular. Finally, we continued through the rest of the grounds - again lingering at the rock garden. We had missed the aquarium and all other temples, since the whole town was closing down at 5pm. Therefore, we headed to the train station for the trip back to Sendai and then onto Aomori -- where we would board the Doraemon train the next morning at 9:15am! Accommodation 8 We actually stayed in Sendai instead of in Mastushima since Tara's headache worsened as we rode on the Shinkansen and she wanted to get to sleep as soon as possible. Left Tokyo at 7:44pm and arrived Sendai at 9:22pm.